I hope you had a “ghoulishly” good time this past Halloween! Looking ahead, I wish you and your family a healthy, happy and safe Thanksgiving. Start planning those holiday visits and holiday family story recordings now! 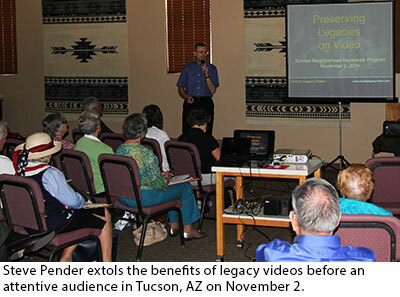 Announce your gift of a video legacy with a Family Legacy Video® gift certificate. There’s no better present for the storyteller in your family than his or her own personal video biography. With Thanksgiving bearing down on us, there’s not enough time to actually start AND finish a project this year. BUT, we can at least start the process. And, when you do, Family Legacy Video® can send you a personalized gift certificate you can use to announce your gift. We can either print a certificate and snail-mail it to you, or e-mail you a PDF file you can print yourself. All that’s needed to get started is a signed memo of agreement and a down payment on your project. Like more details? Contact Family Legacy Video® today. With those words, I was off and running on my latest presentation, as part of a Sunday afternoon program sponsored by the Sunrise Neighborhood Assistance Program of Tucson, Arizona. I explained just what a video biography was, described in a nutshell the process I use to create a legacy video and outlined the benefits of preserving personal stories in a video biography format. Most importantly, I showed several sample clips so attendees could see for themselves just how legacy videos look and sound – and see what the possibilities could be for them. Helping to inform and inspire folks is part of my mission as president of Family Legacy Video, Inc. I realize that many folks don’t know what a video biography is and that they can pass along their life stories and values this way. I always enjoy introducing potential storytellers to the subject. It’s especially delightful when audience members approach me after a presentation to tell me some of their stories and discuss how they can start planning their legacy video. That tells me that they “get it” in terms of understanding the importance of sharing their experiences and wisdom with present and future members of their families. I also find that when I detail the myriad benefits video legacy projects, I reinforce to myself the importance of the work I do as a personal historian – a valuable side benefit for me. So if you have a group of folks who you think might like to learn about preserving, celebrating and sharing their life stories with their own personal video biographies, give me call or shoot me an e-mail. I’m only too happy to talk.